2013 was the year smartphones became commodities, just like the PCs they supplanted. Even at the high end, Apple and Samsung’s newest flagship phones weren’t big leaps ahead from previous versions. The most that Apple could think to do with the new, faster processor in the iPhone 5S was animate 3D effects that make some users feel ill and a fingerprint sensor that solved a problem that wasn’t exactly pressing. Apple’s new iOS 7 mobile operating system, which felt “more like a Microsoft release,” crippled many older iPhones and led to complaints of planned obsolescence. What a sad pile of piss-on-everything cynicism. Was 2013 a seminal or particularly extraordinary year for technology? No, I’d say not. But it certainly wasn’t a “lost year”, by any measure. If indeed it was the year “smartphones became commodities”, how is that not a sign of remarkable progress? 20 years ago, dumb cellular phones were exorbitantly expensive and pagers were a thriving business; today, even commodity-level $100 pre-paid phones are full-fledged personal computers. If it’s in the nature of progress to move in leaps, there are necessarily lulls in between. Here are all the reasons 2013 was a great big dud for technology as a whole. 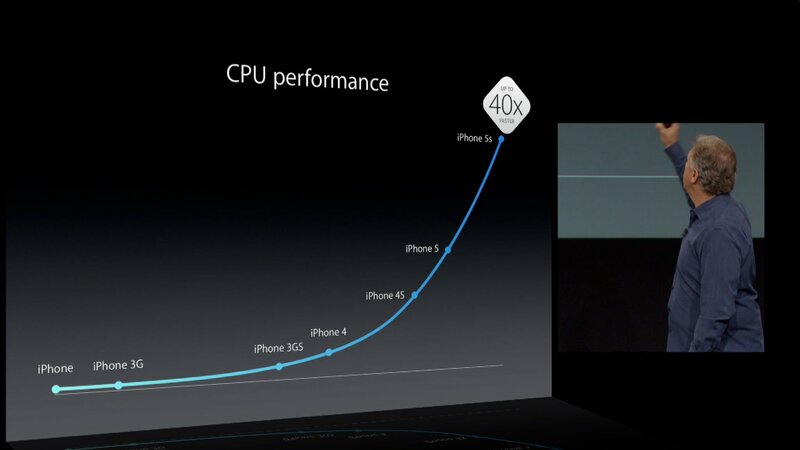 Today we have mobile phones and tablets running on a 64-bit desktop-caliber CPU architecture. Four months ago, we did not. If you’re not excited by the performance of the A7 SoC or, say, the quality of the iPhone 5S camera, why even bother writing about technology? No one could argue that iOS 7 wasn’t a major update, so instead Mims takes to disparaging it. Is iOS 7 an improvement in every single regard? Certainly not. But on the whole, it’s quite good, introduces some well-needed conceptual cohesion, and best of all, it shows that the company is not afraid to boldly move forward from the Steve Jobs era. The whole “planned obsolescence” thing — started by New York Times economics columnist Catherine Rampell, but promulgated by Mims himself after the ball got rolling — was a pile of horseshit. No company in the computer/mobile industry makes products that hold their value longer than Apple’s. Used two-year-old iPhone 4S’s can be sold for $300; three-year-old iPhone 4’s still sell for $200 or more. What other companies make cell phones that retain any value at all after two years? Which release of iOS was it that caused no problems whatsoever for some number of users upgrading older iPhones? Where is the mobile operating system that does a better job supporting older hardware than iOS? It’s a throwaway line, Mims’s description of iOS 7 as having “crippled many older iPhones and led to complaints of planned obsolescence”, but it — along with the general “Apple Trap” narrative spawned by Rampell’s piece in The New York Times Magazine — exemplifies everything wrong with how Apple is covered by the technology press. It begins with a pernicious lie: that Apple somehow booby-traps its devices to malfunction after a certain too-brief period to spur upgrades to brand-new products. The lie is most easily disproven, objectively, by the aforementioned high resale value of used Apple products, including the iPhone 4 at the core of Rampell’s personal tale of upgrade woe. iOS 7 did cause real problems, some quite severe, for some users upgrading older iPhones (and I have no reason to doubt that Rampell was one of them). This happens with every major update to every operating system. Were the upgrade problems with iOS 7 any worse than previous versions of iOS? If so, not by much, from what I’ve seen. And even so, is this not an obvious possible consequence of the magnitude of the changes in iOS 7? On the one hand, the tech press clamors for more innovation at a faster pace from Apple; on the other, when the company redesigns every single visual element in the entire OS, bugs are held up as evidence of a deliberate conspiracy rather than honest (and as anyone who has ever worked on software would understand, inevitable) mistakes. It’s a damned if they do, damned if they don’t scenario for Apple. If a three-year-old device doesn’t qualify for an iOS upgrade, one could argue that Apple is excluding it out of spite, to pressure the user to buy a new device just so they can run the latest software. But if Apple does provide an update for a three-year-old phone, and the upgrade proves problematic for some of them, then they’re accused of booby-trapping it, suckering users into upgrading their iPhones to a version of iOS that makes them run worse, so that the users will run out and buy a new iPhone. What sense does this conspiracy theory make, though? There certainly is some lock-in to any platform, but can we not all agree there is less lock-in in mobile than anything else? Everyone is a recent switcher — iOS and Android are both relatively new platforms. Just a few years ago BlackBerry was riding high. In some ways, it’s easier to switch from an iPhone to an Android phone than it is to switch to an iPhone on a different carrier. If older iPhones suffer upon being updated to iOS 7 — getting slower, or worse battery life, or losing Wi-Fi — to such a degree that the users conclude they now need to buy a new phone, would not the most likely and logical result be that it would inspire many of them to switch to Android (or Windows Phone, or anything) rather than to buy another iPhone? If your car breaks down after just a few years, are you not more likely to replace it with a different brand? To posit that Apple customers are somehow different, that when they feel screwed by Apple their response is to go back for more, is “Cult of Mac” logic — the supposition that most Apple customers are irrational zealots or trend followers who just mindlessly buy anything with an Apple logo on it. The truth is the opposite: Apple’s business is making customers happy, and keeping them happy. They make products for discriminating people who have higher standards and less tolerance for design flaws or problems. Android devices are famously slow to receive major software updates, and tend to get none at all. The carriers control the updates for Android phones, and the carriers really do want you to buy a new phone as soon as your two-year contract is up. Even with Google’s Nexus phones — for which Google, not the carriers, issues software updates, like Apple does — they only support an 18-month window for OS updates. Thus their own Galaxy Nexus phone, released in November 2011, did not qualify for the Android 4.4 update released a few months ago. Apple supports four generations of iPhone with iOS 7, Google just two generations of Nexus phone with Android 4.4 — but it’s Apple that has widely been accused of devious “planned obsolescence”. I bought a Droid 4 twenty-one months ago. As a devout user of physical QWERTY keyboards, I’m pretty sure I’m screwed. My two-year contract expires in just three more months, but I don’t know if my phone will make it. I touch-type all my interviews into my Droid, but it’s simply not reliable anymore. There isn’t a day that goes by without some app experiencing crippling slowdown. The phone just can’t seem to hold a charge. Mims’s claim that “2013 was a lost year for tech” seems of the mindset that the role of the pundit is to drag everything and everyone into the muck, to piss on anything nice, to presume that Sturgeon’s estimation of how much of everything is crap was 10 percent short. But not everything is crap. 2013, like every year, brought us technological progress and wonder in doses large and small and sometimes surprisingly delightful. Computers have always been too difficult to use by non-experts; thanks to the iPhone and iPad — and, yes, Android and Windows Phone, too — we as an industry are finally producing devices and software that are good enough for non-experts to use with confidence. We’re crossing a hump where computers — in the form of tablets and phones — are finally a source of fun rather than fear and confusion. To dismiss the progress achieved during 2013 in this decades-long crusade is just sad. While Mims is apparently waiting around for jetpacks and self-driving cars, iPads are changing the way the world works. That which escapes the grasps of Sturgeon’s Law and achieves genuine excellence deserves to be celebrated, not torn down through false equivalences and the sensational exaggeration of imperfections. Call the imperfections out, to be sure — the job of the press is not to whitewash or cheerlead, either — but keep them in perspective; write about them in proportion to their severity and actual prevalence and relevance. There is a profound difference between that which is crap and that which is merely flawed.